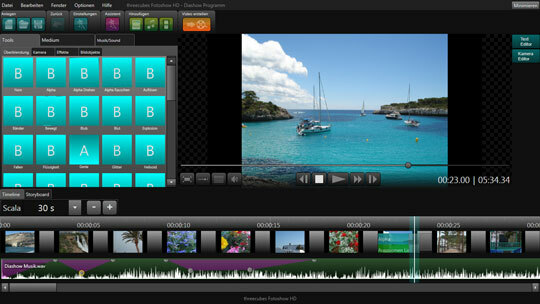 The slideshow program threecubes Slideshow HD 2 enables you to create breath-taking photo presentations with background music, numerous visual effects, image titles and cross-fades. Once you have applied the finishing touches to your slideshow, the program converts it to video format. By using Windows Media Video (wmv) and "webm", slideshows are created in full HD and 4K quality. This means you can display your videos and photos as video on a pc, tv, or via a beamer. A simple click also allows you to upload and publish them directly on Facebook or Youtube. You can use an unlimited number of photos, videos and music titles for your slideshow. Over 40 cross-fades, over 15 image effects, as well as predefined and freely customizable tracking shots will enrich your photographic experience. Added music is easy to edit and volume settings are adjustable. A "Slideshow Assistant" helps you to complete slideshows quickly. Upon launching the assistant, individual settings of the slideshow are defined, such as display duration, the application of selected cross-fades and which tracking shots are to be used. The following steps define the photo selection and music to be played. A simple click then converts your slideshow into video format. The installation files for threecubes Slideshow HD 2 can be downloaded in a 32-bit or a 64-bit version. The setup file automatically recognizes the version supported by your operating system and subsequently installs the required version. This site does not contain serial number, crack, keygen threecubes Fotoshow HD serial number : serial number is the simplest type of crack. A serial number(cdkey,product key,etc) is register the program as you may already know. a crack or keygen may contain harmful software. If you cannot find the exact version you want, just give it a try. for more information read .nfo/.txt/.diz file include in zipped file.